It's easily the biggest Blu-ray release of the year, if not the biggest release in the history of the format. It's loaded to the gills with special features, behind the scenes documentaries, and plenty of surprises. It also represents quite a financial investment. We're talking of course about 'Star Wars: The Complete Saga,' and boy have we got some exciting news for you! 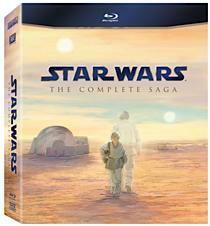 We're awarding one free copy of 'Star Wars: The Complete Saga' to a very lucky High-Def Digest Forum member! Visit the High-Def Digest Forums from the link provided at the bottom of this announcement. If you're a newcomer, be sure you set up an HDD forum account, we're always excited to see new members in the community! "When did you first see any of the 'Star Wars' movies? Tell us the story and what made that initial visit to the 'Star Wars' universe so memorable for you!" We want to know how the movie made you feel the very first time you sat down and watched Luke, Han, Obi-Wan and the rest of the gang take on Darth Vader and the Emperor. Who did you see it with? Did you sleep on the sidewalk to get tickets on opening day? Were you dressed as Chewbacca? Share your experience in a forum post and you're entered to win! Simple as that. Of course, no High-Def Digest employees or their family members are eligible. This is for our readers and forum members only. This contest will run from September 12 through September 19th. The winner will be picked at random, and his or her name will be announced on Tuesday, September 20, 2011! So, what are you waiting for? Enter to win one of the biggest Blu-ray releases since the format was introduced! We can't wait to read your stories!